ابراهیم نژاد, حامد, مصلایی پور, مسعود. (1396). تأثیر فرآیند اصطکاکی اغتشاشی بر ریزساختار و خواص مکانیکی فلزجوش ایجاد شده توسط GMAW بر St-37. 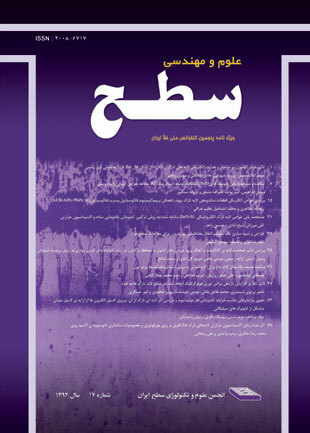 نشریه علوم و مهندسی سطح, 13(32), 31-39. حامد ابراهیم نژاد; مسعود مصلایی پور. "تأثیر فرآیند اصطکاکی اغتشاشی بر ریزساختار و خواص مکانیکی فلزجوش ایجاد شده توسط GMAW بر St-37". نشریه علوم و مهندسی سطح, 13, 32, 1396, 31-39. ابراهیم نژاد, حامد, مصلایی پور, مسعود. (1396). 'تأثیر فرآیند اصطکاکی اغتشاشی بر ریزساختار و خواص مکانیکی فلزجوش ایجاد شده توسط GMAW بر St-37', نشریه علوم و مهندسی سطح, 13(32), pp. 31-39. ابراهیم نژاد, حامد, مصلایی پور, مسعود. تأثیر فرآیند اصطکاکی اغتشاشی بر ریزساختار و خواص مکانیکی فلزجوش ایجاد شده توسط GMAW بر St-37. نشریه علوم و مهندسی سطح, 1396; 13(32): 31-39. در این پژوهش بمنظور اصلاح ساختار و خواص مکانیکی فلزجوش حاصل از فرآیند قوس فلز-گاز(GMAW) بر فلزپایه St-37، از فرآیند فرآوری اصطکاکی اغتشاشی(FSP) استفاده شد. مطالعات ساختاری فلزجوش نشان داد که ساختار ریختگی و زمخت فلز جوش ایجاد شده توسط فرآیندGMAW، با اعمال عملیات FSP به یک ساختار ظریف و یکنواخت تغییر می‌نماید. توضیح آن‌که با اعمال FSPبر فلزجوش، اندازه دانه این منطقه تا حدود 50% کاهش می‌یابد. تغییرات دانه‌بندی مذکور را می‌توان به فعال شدن پدیده تبلورمجدد بواسطه تغییر فرم شدید همراه با افزایش دما حین عملیات FSP نسبت داد. ارزیابی خواص مکانیکی نمونه‌ها آشکار نمود که با اعمال عملیات FSP بر فلزجوشGMAW، پروفیل سختی منطقه جوشکاری شده یکنواخت‌تر و درصد ازدیاد طول نسبی فلزجوش FSP شده نسبت به فلزجوشGMAW بهبود می‌بابد که می‌توان به یکنواختی و ریزدانگی ساختار بعد از اعمال فرآیند FSPنسبت داد. 1. R.S.Mishra, Z.Ma, Friction stir welding and processing, Materials Science and Engineering, (2005)1–78. 2. I.Charit, R.S.Mishra,Low temperature superplasticity in a friction-stir-processed ultrafine grained Al–Zn–Mg–Sc alloy, Materials Science and Direct, (2005)1-35. 3. A.Rao, V.Katkar, G.Gunasekaran, V.Deshmukh, N.Prabhu, B.Kashyap, Effect of multipass friction stir processing on corrosion resistance of hypereutectic Al-30Si alloy, Materials Letters, (2015)417-419. 4. K.Nakata, Y.Kim, H.Fujii, T.Tsumura, T.Komazaki, Improvement of mechanical properties of aluminum die casting alloy by multi-pass friction stir processing, Materials Science and Engineering X , (20104)274–280. 5. F.Khodabakhshi, A.Simchi, H.Kokabi, M.Nosko, F.Simanĉik, P.Švec,Microstructure and texture development duringfriction stir processing of Al-Mg alloy sheets with TiO2 nanoparticles, Materials Science and Engineering, (2014)1-17. 6. S.David, S.Babu, M.Vitek, Solidification and Microstructure, Metals& Ceramics Division, (2003)37831-6095. 7. V.JeganathanArulmoni, R.S.Mishra,Friction Stir Processing of Aluminum alloys for Defense Applications, International Journal of Advance Research and Innovation, (2014)337-341. 8. H.Grewal, S.Arora, H.Singh, A.Agrawal,Surface modification of hydroturbine steel using friction stir processing, Applied Surface Science,(2013)315-412. 9. Codrick J. Martis, K.Susil, K. Putatunda, James Boileau, G.JohnSpray,The static and dynamic mechanical properties of a new low-carbon, low-alloy austempered steel, Materials Science & Engineering A, (2014)280-287. Rapid surface hardening and enhanced tribological performance of 4140 steel by friction stir processing, Wear332-333, (2015)962-970. 11. A.Rahbar-kelishami, A.Abdollah-zadeh, M.Hadavi, R.Seraj, A.Gerlich,Rapid surface hardening and enhanced tribological performance of 4140 steel by friction stir processing, Applied Surface Science, (2014)501-507. 12. Matsushita, Development of friction stir welding of high strength steel sheet, Science and Technology of Welding and Joining, (2011)181-187. 13. A.Ghasemi-kahrizsangi, S.Kashani-Bozorg, F.Moshref-Javadi, Effect of friction stir processing on the tribological performance of Steel/Al2O3 nanocomposites, Surface & Coatings Technology, (2015)1-28. 14. G.Brodova, PS.Popel, Liquid Metal Processing, New York:’ Taylor & Francis, (2002). 15. J.de Jesus, A.Loureiro, J.Costa, M.Ferreira, Effect of tool geometry on friction stir processing and fatigue strength of MIG T welds on Al alloys, Journal of Materials Processing Technology, (2014) 2450-2460. 16. P.Atapour, A.Pilchak, G.Frankel, J.Williams, Corrosion Behavior of Friction Stir-Processed and Gas Tungsten Arc-Welded Ti-6Al-4V, Metals & Materials Society, (2014). 17. H.Hussain, M.AliEljaraiow, S.Al-Jadi, Erosive Wear Resistance of Austenitic Stainless Steel Surfacing Deposited on Carbon Steel Plate by GMAW at Different Welding Parameters, ICEIT, (2012) 84-91. 18. ASM Hand Book, Welding, brazing and soldering, Volume 6, (1993)288-344. 19. M.Jafarzadegan, A. Feng, A.Abdollah-zadeh, T.Saeid, J.Shen, M.Assadi, Microstructural characterization in dissimilar friction stir welding between 304 stainless steel and st37 steel, Sciverse Science Direct, (2012). 20. S. Kou, Welding Metallurgy, second edition, John Wiley & Sons Inc, (2003) 197-410. 21. C.Thaulow, A.J. Paauw and K. Guttormsen, The Heat Affected Zone Toughness of Low carbon Microalloyed Steel, Welding Research Supplemment, Sep. (1987)266s-279s. 22. W.Tianqi, L.Liangyu, L. Xiao, Y. Xu,The Numerical Simulation and Control of Microstructure in Heat-affected Zone in GMAW, Modern applied science, Volume 3(2009)163-166. 23. T.Lienert, W.Stellwag, B.Grimmett, R.Warke, Friction stir welding studies on mildsteel, Suppl Weld J Jan, (2009)1s-9s. and stainless steel 316,Springer-Verlag, (2014)573–579. 25. A.Kumar, M.Kumar, studyoffrictionstirweldinganditsprocessparametersForjoiningofdissimilarmetals,South Asia Journal of Multidisciplinary Studies SAJMS, 1(2015)77-88. 26. L. Huabing, Shouxing, Z. Shucai, Microstructure evolution and mechanical properties of friction stir welding super-austenitic stainless steel S32654, Materials and Design, (2017)207-217. 27. P.Xue, B.Xiao, W.Wang, Q.Zhang, Q.Wang, D.Wang, Z.Ma, Achieving ultrafine dual-phase structure with superior mechanical property in friction stir processed plain low carbon steel, Materials Science & Engineering A, (2011)30-34.